This vintage horseshoe display was made for the Diamond Tool and Horseshoe Company of Duluth, Minnesota. 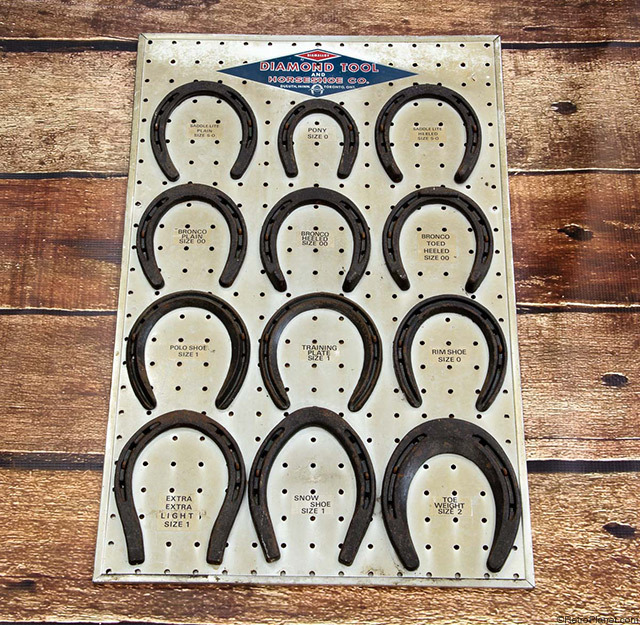 This is the type of board that would have been displayed in a hardware store or tack shop to showcase the variety of sizes and uses for the different horseshoes available to order. The shoes range from a diminutive “Pony” shoe to a “bronco” to a “Polo” shoe. As a vintage find, this display is a striking example of American craftsmanship and a cool collectible for equestrian enthusiasts or anyone that likes cool vintage finds. Diamond Tool and Horseshoe Company was started by Swedish immigrant Otto Swanstrom, who worked as a blacksmith in a lumber camp making horseshoes. He felt it was too time-consuming to remove the whole horseshoe every time the calks needed to be sharpened. The “calks” are the stud or cleat shapes on the rear, and often front, of the horseshoes that were built in to provide the a better foothold on uneven or slippery surfaces. Today it’s common to see calks on draft horses that pull loads and on race horses. Swanstrom’s timesaving solution was to make removable calks that could be added or removed from shoes as needed without taking the entire shoe off. He received a patent for the removable calk and founded the Diamond Calk and Horseshoe Company in 1908. The company manufactured both horseshoes and calks, and at first, only had two employees. With the introduction of the automobile, the Diamond Calk and Horseshoe Company found they could not be wholly dependent on the making of horseshoes, and added adjustable wrenches to their product line, keeping the company going throughout the depression years. The company’s success led to the expansion of their production by adding pliers, cutters and other tools. 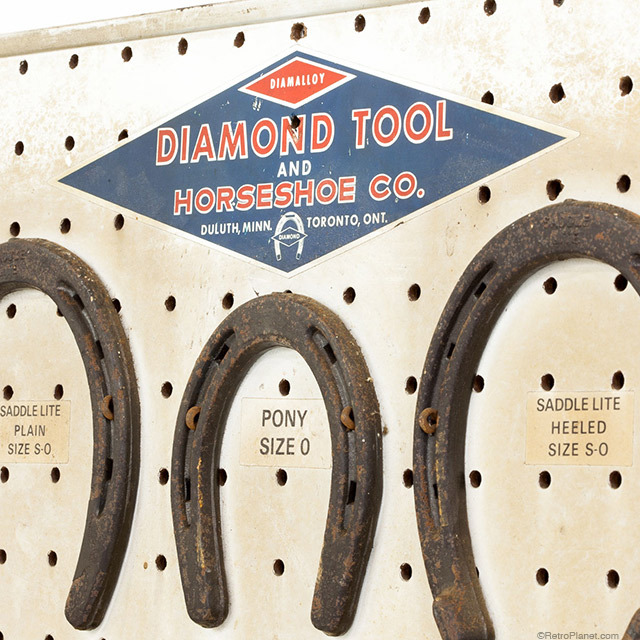 By the late 1950s, the company name was changed to the Diamond Tool & Horseshoe Co. In 1981, the family run business was purchased by the Triangle Corporation, who in turn was acquired by Cooper Industries and is now part of Bain Capital, operating under the name of Apex Tool Group. 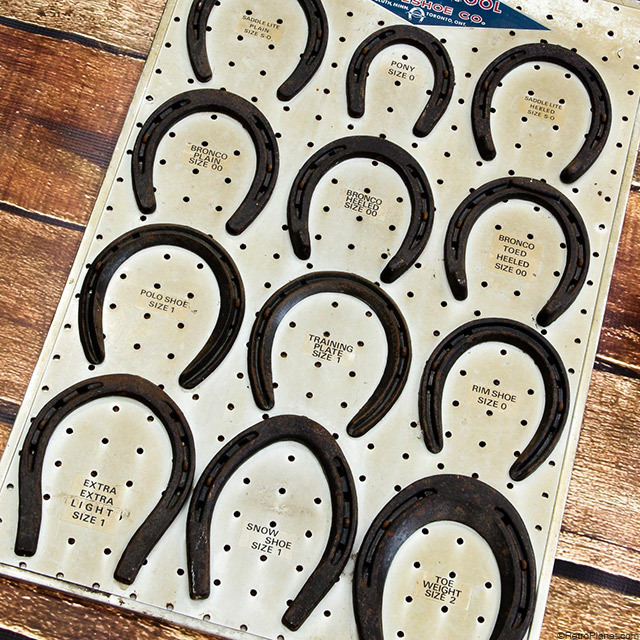 Based in Maryland, Apex sells Diamond brand farrier tools and supplies—including horseshoes.